It was last November/December when I had invited my friend Leslie and her family for dinner. She brought a big batch of sugar cookies that were beautifully decorated with some colored sugar. Ishaan was around 3 and 1/2 then. He ate atleast 4-5 cookies in one go. I had never seen him liking any cookie like that. I asked Leslie for the recipe and she was very kind to share it with me. It then sat there for a long time. I was pregnant at that time and somehow forgot all about it. Then last month for Thanksgiving, I thought I would bake some cookies and send to Ishaan’s school. I remembered these cookies because I knew kids would love these. I asked for the recipe again. But then I got busy and could not bake. Finally we decided to bake this yesterday. Ishaan wanted to help decorate them. He decorated using M&Ms and chocolate chips. He said he is practising patterns – he had arranged the toppings in some pattern in all rows. Once done, he counted all to see how many we had in each tray. I really enjoyed the whole experience. 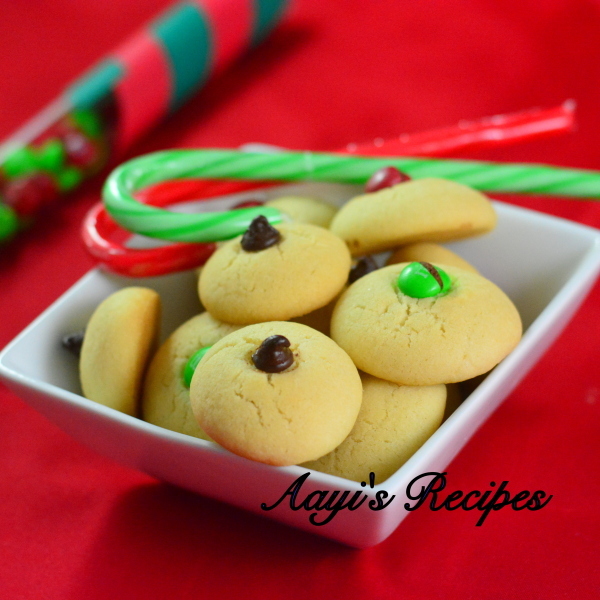 I think Santa will get some of these cookies if Ishaan does not eat all of these before 24th!. Thank you Leslie for the recipe. 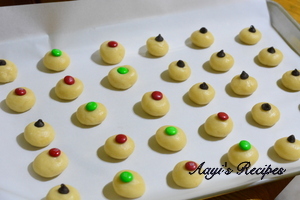 Shape and decorate cookies. Then bake them. Beat together sugar, powdered sugar, butter and oil. 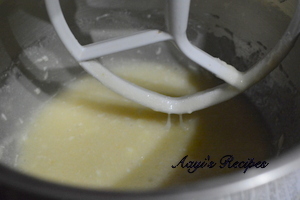 Then add all other ingredients and mix well. Preheat the oven at 375F for 10mins. Shape them into small rounds and decorate as you wish. In the original recipe, it was mentioned to drop the cookie dough by teaspoon on greased cookie sheet as soon as it was prepared (no resting). Then flatten with a fork to create a + and sprinkle with colored sugars before baking. I wanted to bake round cookies, so I refrigerated them for 30mins and then shaped and decorated them. Hi shilpa , can I use castor sugar in place of powdered sugar ? The powdered sugar you mentioned is it the caster sugar? This is the first time I am at your page and loved it have created a bucket list to try so many recipes . One request how do I replace the egg in these sugar cookies . 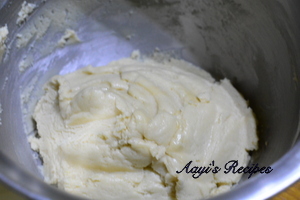 I suggest making nankatayi instead. Wow, these Cookies looks so delicious! 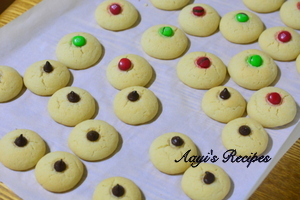 I will definitely be keeping my eyes open for them.Thanks for sharing the recipe of cookies with easy way…yours sounds much better!